Hurdy Gurdies have two main tuning configurations. Our instruments can accommodate either tuning very well, it's just a matter of which string set we put on before we ship it out to you. All strings are tuned to either 'G' or 'C' notes. The keychest is set up like a piano keyboard, where the main row of buttons is in the key of 'c', and the 2nd row of buttons are the chromatics. ​This is the default tuning we use when we ship out a new instrument. Because the keys are similar to a piano, it's also the most beginner friendly. It's also generally well suited to French traditional music. -Both tuned to 'g', but an octave apart (g3 & g4). See chart above. We usually set them up in the octave tuning by default. If you prefer something different, let us know at the time of ordering. Keychest as viewed from player's perspective. Notes added for clarity. The melody strings are tuned to 'd'. 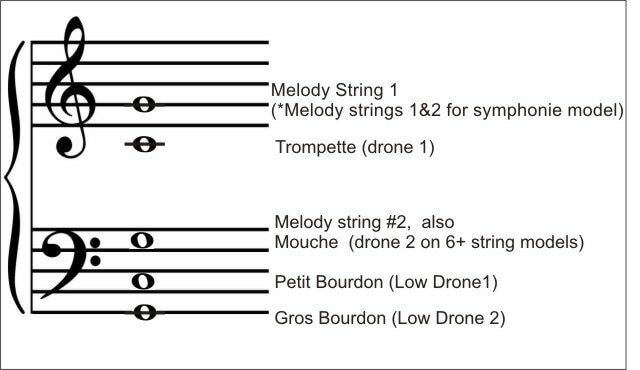 The drone strings are toned to D or G notes of various octaves. Note the #10 chromatic key: this key can be either 'C' or 'C#', to best suit the player's needs. By default we tune it to 'c' before shipping. This tuning is well suited to Celtic music. If you prefer this setup, just let us know at the time of ordering. -'low' octave tuning: chanterelles tuned to d3 & d4. The high octave string (d5) can be a little more demanding on cotton & rosin technique, so we only recommend that for more experienced players. If you have a specific tuning in mind, please let us know at the time of ordering.